During the closing activity of the night, one-by-one each student approached a music stand (acting as podium) in the front of the room and stated the changes they most desired to see in society by completing the phrase, “If I were the president of the United States, I would_____.” The voices of our Casa “presidents” revealed many diverse dreams, some of which included, “open the borders,” “provide health care and aid to immigrants,” and “eliminate gun violence.” Other responses were simply fun and light-hearted: “free the world from work in order to relax,” which were also not unexpected coming from weary students after full days and weekends working at various jobs. 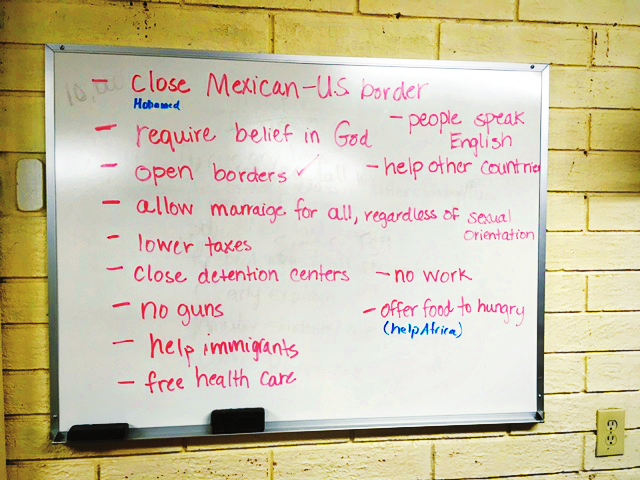 And one, surprisingly, “close the U.S.-Mexico border.” Inevitably, these students, many of whom arduously traveled for miles over extended periods of time to arrive in the U.S. and spent many months in detention centers at the border, entered into a back-and-forth discussion regarding these political issues. Ultimately, the conversations concluded with the general consensus of “reforming,” rather than “completely closing down,” detention centers at the border. These expressions of diverse opinions and civil debates represented the ideas and perspectives coming from a variety countries, cultures and social groups. The students’ efforts exceeded expectations for the stimulating linguistic and cultural environment that teachers strive to create. Not only did the students enthusiastically participate in the lesson, but they also fostered inclusive and respectful opinions in the context of diverse perspectives. Even more than in any other lesson, these students excelled to both learn about, and represent, the valued qualities of American society.